'One shouldn't mock the afflicted', well brought-up children used to be told. An excellent precept, which we shall gladly dispense with in the case of COP23, the 'Conference Of the Parties', the UN Climate Change Conference, this year in Bonn. Strictly speaking, as is clear from its name, this is a conference for the signatories of the United Nations Framework Convention on Climate Change who meet to agree on… er, whatever. This procedure involves the representatives of 196 countries as well as groupings such as the EU and various territorial regions. Well, in the way of such things, one delegate is never enough, even for tiny places that most people could not locate on a map: every signatory has to have a team. That is just the core, though, since in addition to the representatives of governments, many thousands of delegates come from media organizations and above all from the many NGOs sucking on the engorged teats of the global warming sow. All in all about 25,000 attendees. The host this year was Fiji. Except, of course, that Fiji couldn't physically host the event. Its population of around 900,000 is spread over a number of islands and the main locations are far too small to cope with a conference of this size. The sight of 25,000 delegates jetting off to a tropical island would have embarrassed even the otherwise brazen UNCCC. So the German city of Bonn hosted the event. Its population of around 300,000 is even smaller than Fiji's, but it has two great advantages: 1) a civilisation infrastructure and 2) money – lots and lots of it, from the city, the state and the federal government. Both of these are essential requirements for any apocalyptic movement that wants to re-establish the Stone Age for the sake of well-being of the planet. Bonn is also conveniently the headquarters of the UN Climate Secretariat, so the beach-head had already been established there and now merely required a gesture of gratitude: 'Show me you deserve me', the UN said to the city, which is exactly what the city then did. There is, however, some irony in having Bonn host the conference instead of Fiji: if sea-levels do rise dramatically, Bonn will be submerged a long time before Fiji will. Even Bonn, once a small town on the Rhine that accidentally became the provisional capital of Germany for forty years, was not up to coping with a meeting of this size. No problem: the climate business is awash with money, sufficient to throw at almost any difficulty and make it disappear. Bonn had some existing facilities clustered around the UN property which could cater for the governmental delegates and media (the 'BULA Zone'). But what about the riff-raff, camp-followers and hangers-on? Let's build a pop-up locale for them. There was space in the nearby Rheinaue Park, an idyll of lawns, lakes and flowerbeds. Let's call it the 'BONN Zone'. And, while we're at it, we can do something like this in the BULA Zone, too. 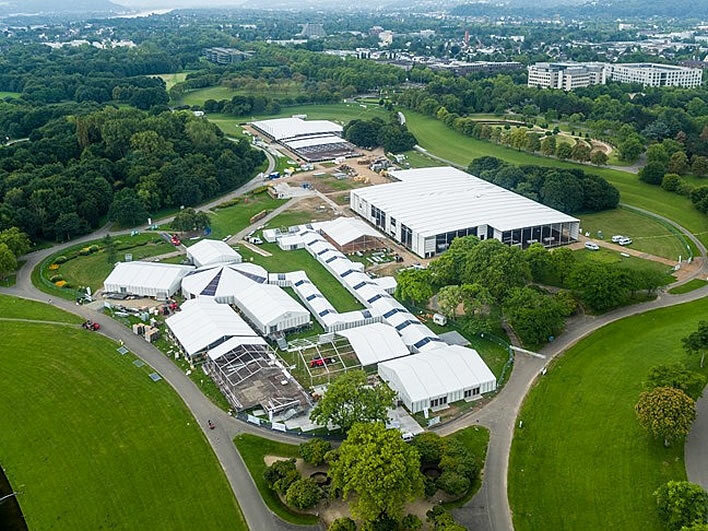 The project employed 6,000 people altogether, a large number of them construction workers who not only erected the entire temporary BONN Zone, but also extended the BULA Zone with temporary structures, too. The BONN Zone under construction. Image: Dominik Ketz, UNFCCC. The word 'temporary' is a little demeaning: some of these structures are two-storey frameworks. Calling them 'tents' also misses the mark: their cladding was of course not canvas but that hallmark of modern civilisation, high quality plastic. Thousands of wooden panels were required for their flooring, all in all 50,000 square metres of wood (the equivalent of a sheet 50 metres wide that extends for a kilometre). By next year it will have all been dismantled and the joggers and lunchers in the park will find no sign that it had ever been. We are told that all this immense effort is, of course, environmentally sustainable and independently certified to be such. Presumably the filthy wooden floor panels can be used as fuel in a wood-burning power station, thus, in some mystical way, compensating for their existence. But however you twist the sustainability argument you are left with the thought that all this effort and money has been expended on a pointless ten-day conference, never to be recovered. If we go beyond the looking-glass world of climate alarmism we have to ask: were these months of labour, these millions of Euros in any way worth it for a conference that achieved nothing other than to keep the climate caravan on the road? At least when the absolutist despots of history had a rush of blood to the brain and built immense and immensely expensive structures for their own glory – Ludwigsburg, Versailles, Sanssouci and many others – something was left; or the devout built the great cathedrals for their place in Heaven – we have them today; or when the blood-soaked princes of the Italian city states commissioned frescoes, paintings and sculptures they started a Renaissance from which we benefit today; or even when modern governments, those most blunt of all economic instruments, spend on public works, there is at least something left for subsequent generations. In all these ways civilisation has been in some measure enriched, albeit often on the backs of that generation of peasants. But COP23, built on the backs of the western taxpayer, has enriched no one, left the common man nothing, left nothing behind, either of physical or immaterial value. It was just one terrible waste leading up to the next one, next year in Poland. Its only beneficiaries have been those sucking on its teats. Topical note: At the time of writing, shares in Aggreko, the manufacturers of the generators in the video report, have fallen dramatically (-11%).